New single-molecule imaging of the eisosome BAR domain protein Pil1p reveals filament-like dynamics. 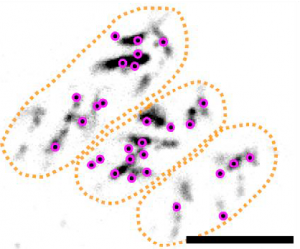 Molecular assemblies can have highly heterogeneous dynamics within the cell, but the limitations of conventional fluorescence microscopy can mask nanometer-scale features. We have developed a novel, broadly applicable, fluorescent labeling and imaging protocol, called Single-molecule Recovery After Photobleaching (SRAP), which allowed us to reveal the heterogeneous dynamics of the eisosome, a multi-protein structure on the cytoplasmic face of the plasma membrane in fungi. By fluorescently labeling only a small fraction of cellular Pil1p, the core eisosome BAR domain protein in fission yeast, we visualized whole eisosomes and, after photobleaching, recorded the binding of individual Pil1p molecules with ~20 nm precision. Further analysis of these dynamic structures and comparison to computer simulations allowed us to show that Pil1p exchange is spatially heterogeneous, supporting a new model of the eisosome as a dynamic filament. This entry was posted in Uncategorized on December 11, 2016 by jb246.